Dear Rafael Esquivel: So long and thanks for all the kits (But I don’t like that yellow at all). Huge news out of Zurich today, where several high ranking members of FIFA were arrested for alleged corruption and money laundering. 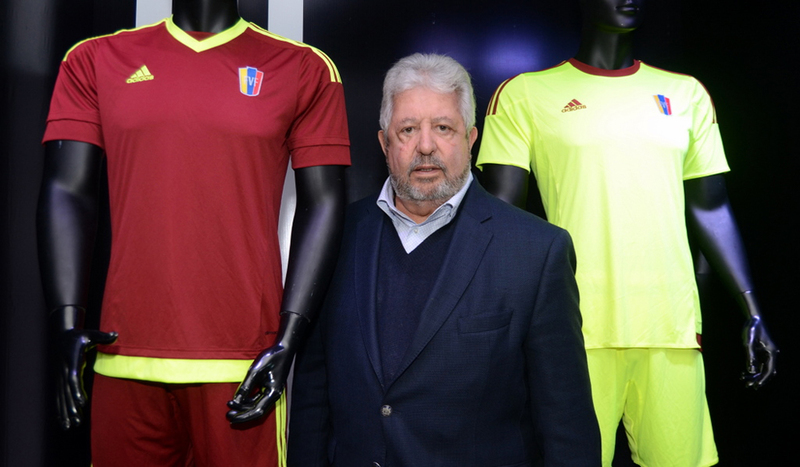 One of them is Rafael Esquivel, chairman of the Venezuelan Football Federation (FVF) for the last 27 years and first Vice-President of the South American Football Confederation (CONMEBOL) since March. You read that right, twenty seven years. Swiss authorities acted following a U.S. Department of Justice extradition request, which accuses nine FIFA officials and five others of “…racketeering, wire fraud and money laundering conspiracies”. Among the detained are the former head of CONMEBOL, Nicolás Leoz and both the current and former heads of CONCACAF, (North, Central American and Carribean Football Confederation). Though some news reports mention that these arrests could be related to the controversial awarding to Russia and Qatar of the 2018 and 2022 World Cups respectively, the case is mostly about corruption involving licensing rights. The indictment alleges that, between 1991 and the present, the defendants and their co-conspirators corrupted the enterprise by engaging in various criminal activities, including fraud, bribery and money laundering… All told, the soccer officials are charged with conspiring to solicit and receive well over $150 million in bribes and kickbacks in exchange for their official support of the sports marketing executives who agreed to make the unlawful payments. For Esquivel, this looks like the end of the line. Regardless of the improvements the Vinotinto achieved on his watch, the current state of our fútbol is quite worrysome. Matter of fact, this comes as he was pushing huge changes in the league format and negotiating new television rights. Let’s not forget that he got quite cozy with the government after unilaterally pushing out Empresas Polar as FVF’s main sponsor and replacing it with State oil company PDVSA in 2012. If Esquivel’s fall serves to improve our football, that’s great. All I can say is, “good riddance”. But this is something way larger than Esquivel: the bombshell comes right on the eve of the election for FIFA President, in which incumbent Joseph Blatter runs for a fifth term. FIFA said the election will go ahead as scheduled. La tendencia, apparently, is irreversible. UPDATE: FIFA’s Ethics Committee has suspended 11 officers involved in today’s developments, including Esquivel. Therefore, the current VP of the FVF Laureano González will take the helm until further notice and he can even complete Esquivel’s term until 2017. The core of the scandal is around CONCACAF, as its main HQ in Miami was raided by the FBI and that the case is based in part on the cooperation of CONCACAF’s former Secretary-General Chuck Blazer, who declared himself guilty and helped the authorities in order to avoid serving time in prison. Finally, a correction: Earlier reports indicated that former CONMEBOL President Nicolas Leoz was detained. Matter of fact, he’s hospitalized on his home country of Paraguay. He was charged by a Brooklyn court and suspended by FIFA.